The Historic Centre of Rome, the Properties of the Holy See in that City Enjoying Extraterritorial Rights and San Paolo Fuori le Mura comprise major monuments of Roman antiquity and papal history. The city of Rome exists since the 4th or 5th century BC, or - according to legend - was founded by Romulus and Remus in 753 B.C. 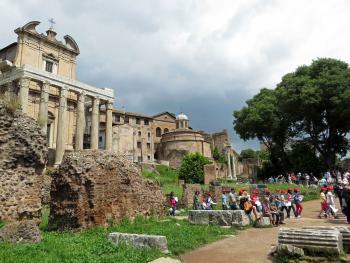 There are still several remains to be found in this modern city dating from the period of the Classical Roman Empire: The Forum Romanum (the former political center) still holds a central position in town. The Colosseum and a triumphal arch are around the corner. Also, the Therms of Caracalla are not far away: a large public bath house where also restaurants, libraries and other forms of leisure activities could be performed. Except for the walls, now there are only some mosaics and wallpaintings left. 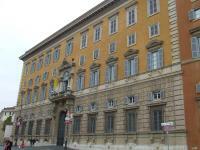 In 1990, the inscription was extended with properties of the Holy See which are located in the historic centre of Rome. Among them the Basilica of San Paolo fuori le Mura. In my opinion, Rome is the most beautiful European capital. So much history in such a small area, without being turned into an amusement park ... where else in Europe can you still find that? One of the lesser known sights is San Clemente, a pretty 11th century church. Stairs lead you down to the remains of a 4th century basilica, which was devastated by Northmanns. Via another pair of stairs you arrive at a Roman house from the 2th century, that served as a shrine for Mithras. I'm not sure what I can say you you wouldn't already know about Rome. It's an incredible city full of history and heritage. The struggle here, I imagine, was choosing what to leave out of the WHS listing. I have been to Rome a few times but on my most recent trip, made the effort to see parts of the Roman Forum and Palatine Hill that I hadn't seen before. I found it really interesting to go deeper into the history and concentrate on just one or two of the important sites in the city. I think if you rush through Rome then you don't do it justice. I've been to the parts of Rome that comprise this UNESCO site twice-back in 2011 and in 2014. There's nothing quite like sitting in a taxi, heading into Rome for the first time, and rounding the corner to see the ruins of the Forum. Today the remains are mostly a jumble of what was rescued from archeological digs. Many of the main sites were covered in 20-30 feet of dirt and debris until the 19th century. It's been a while since I've been, so I don't have great practical tips. However, here's the interview I just conducted about the Roman Forum that goes much deeper into its history: The Roman Forum. 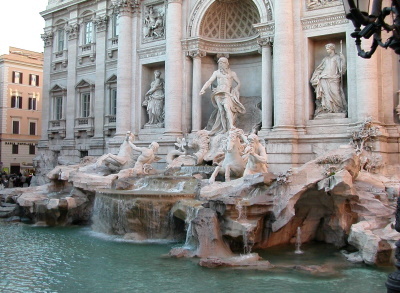 Rome is a world-class city full of architectural wonders, as well as my favorite Italian gastronomic delight -- gelato. After spending hours in the sun touring the Colosseum and the magnificent Forum, or standing in line to see the remarkable architecture of the Pantheon or the nearby Saint Peter's Basilica in Vatican City, a gelato is a worthwhile way to cool off and reflect on how much history the city of Rome has seen. In fact, taking the time to eat a gelato in one of the many piazzas and open fora throughout Rome is a great way to force oneself to slow down and appreciate the awe-inspiring architecture and artwork. I loved how active and beautiful Rome was by day and night, and I have fond memories of the breaks I took in the Piazza Navona, in front of the Pantheon, next to the Trevi Fountain, at the base of the Spanish Steps, and along the Tiber River during my two visits to the city. I don't think one can understate how incredible a city Rome is to view in person, and I highly recommend a visit. Go for the history; stay for the gelato! Logistics: Rome is an easy city to walk around, though the city streets are busy; there is also a bus and Metro system for public transportation. Rome is one of my favourite cities, it has an incredible number of historical monuments and despite the crowds of tourists, it is an enchanting and exciting capital. 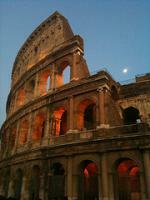 I have visited Rome several times, usually only for a short stay, but in November 2013, we spent five days in Rome. We had seen the main tourist sights on previous visits, and thus we had plenty of time to explore the city without haste and to visit also some of the lesser known sites. First: the three papal basilicas San Paolo fuori le Mura, Santa Maria Maggiore, and San Giovanni in Laterano (St. Peter's is the fourth). Of these, I was most impressed by San Paolo, even more than by St. Peter's, though the basilica is relatively new. It was rebuilt after a fire in the mid-19th century. The large and almost empty nave is amazing, it has a length of 130 meters and four rows of columns. The name of the basilica is derived from its location outside the ancient Aurelian walls, today it is a rather insignificant neighbourhood. It is easy to get to by public transport, it is right next to the metro station Basilica San Paolo. I also liked San Giovanni in Laterano, most striking are the huge statues of the twelve apostles in the nave. The Lateran complex includes also the Lateran Baptistery, the Scala Sancta and the Triclinium of Pope Leo III. Next on our list: the three churches with works by Caravaggio, the enigmatic Baroque painter known for his brilliant use of chiaroscuro (strong contrasts of light and dark). A must see, not only for art enthusiasts, is San Luigi dei Francesi with three paintings in a side chapel. The church is close to Piazza Navona, there are always many tourists, but nevertheless a stunning impression. The two other churches with Caravaggio paintings are Santa Maria del Popolo (Piazza del Popolo) and Sant’Agostino in Campo Marzio (close to Piazza Navona). In Rome, admission to churches is free, but they found a clever way to earn some money: you have to insert 50 Cents to switch the lights on for a few minutes to see the paintings. A bit off the beaten track: the Baths of Caracalla, located in a nice park in the south of the WHS core zone. Although only the walls have been preserved, the sequence of the rooms is still visible and the sheer size of this huge leisure complex is amazing. The Tempietto di Bramante, a lovely little Renaissance chapel, only a short walk from Piazza Santa Maria in Trastevere, but easy to miss, because it is hidden in the courtyard of the monastery San Pietro in Montorio. 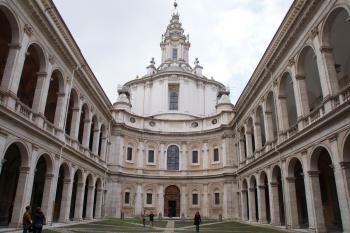 And finally my favourite building in Rome: the Baroque church Sant’Ivo alla Sapienza (photo). My first visit was just by chance, I followed a group of tourists through a rather inconspicuous portal. Then I stood in a courtyard with two-storey arcades and was surprised to find such a quiet place in the heart of Rome, right next to Piazza Navona. The architecture is unique in almost every respect. The façade was embedded in the previously existing courtyard of the Palazzo della Sapienza and therefore it has a concave shape. The dome is crowned by a squiggly spiral-shaped tower. And the interior is also unusual, the floor plan is constructed from an equilateral triangle, the sides have semicircular bulges and the angles are cut off. This results in a complex shape of the dome with alternating convex and concave segments that gradually converts the floor plan into a perfect circle at the top of the dome. Unfortunately, the church is open only on Sunday morning. As Ian Cade quoted in his review: Rome, a lifetime is not enough. There is nothing more to add. I visited this WHS several times. Rome is rightly known as the Eternal City. It can keep you busy for a whole month of sightseeing and you would still be missing something! Needless to say you cannot miss the Colosseum, Pantheon, Trajan's Column, Fori Imperiali, Fontana di Trevi, Piazza di Spagna, and St. Peter's Basilica. Not only one of Italy's top WHS but indeed one of the world's top WHS! Having visited Rome previously on several occasions and seen all the prominent tourist sights, this year I decided to seek out the more obscure sites included in the WHS inscription. My first call was the church of San Paolo Fuore la Mura, a monster church beside a metro station in SW Rome. The rest of the day I spent touring the palazzi, mausolea and churches listed as properties of the Holy See enjoying extraterratorial rights. Of the churches, San Giovanni in Laterano was lavish and splendid, as also was Santa Maria Maggiore. Santa Maria in Trastevere was rather shabby and insignificant by comparison. Augustus' mausoleum was a rather insignificant ruin, while Hadrian's was concealed within the Castel Sant Angelo. The Palaces varied from the shabby and neglected to the pristine serving as museums and offices. My favourite was the Palazzo delle Cancelleria in Corso Vittorio Emmanuele II, where the courtyards housed a collection of Leonardo da Vincio's Big Machines. Another architecturally pleasing example was the Palazzo di Propaganda Fide in the Piazza di Spagna. that gets on your nerves after a few days. Very few cities in the world can claim to be a capital of their cultural sphere, even fewer have something left to show for it. 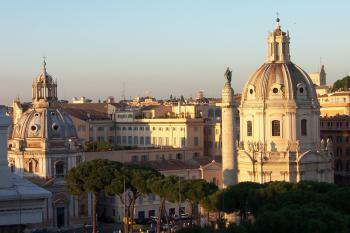 Rome can claim to be a cultural capital twice! and has plenty to show for it. Rome contains some of the best preserved sites from antiquity, when it was a world power and laid much of the foundation for western culture. 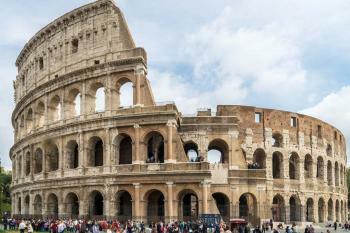 The Coliseum is perhaps the most famous testament from this period, and its huge remains are a great place to start exploring "Ancient Rome". Included in the admission price is entry to the Palatine Hill opposite, which was a nice place to stroll through and look at the massive remains, and provided great views across the city and down onto the Forum, which I think was my favourite part of ancient Rome, well it was until that night I stumbled upon the Pantheon in the tight streets of the historic centre. This building for me was one of the most spectacular I have ever been to, the dome is a masterpiece of architecture. Then the second time Rome became a cultural capital was with the High Renaissance and Baroque periods. The High Renaissance perhaps best seen at Michelangelo's Piazza del Campidoglio and also much of the work at the Vatican. The Baroque period is seen through out the historic centre, the works of Borromini, Bernini and their contemporaries line almost every street, and this is what made the city so enjoyable that just walking between the "big" sites (Trevi fountain, Piazza Navona were particularly great) provided you with other masterpieces that would be highlights in most other cities. This was also mixed with great bars (in Trastevere especially) and restaurants, and the city managed to not feel like a museum or a theme park. I was here for two days and did not stop, I can understand the saying "Roma, non basta una vita" (Rome, a lifetime is not enough). This so far is the finest UNESCO site I have visited and I am looking forward to something being good enough to knock it off its perch, it is going to take an awful lot. Rome isn't the eternal city for nothing. The juxtaposition of imperial remnants and modern technology are classically Italian and only serve to highlight the city's historic value. The Colisseum has found a better use as a tourist magnet than Christian slaughterhouse, and the tiny details, like bas-relief in the architecture and masterful wrought-iron railings leaves no doubt as to why all roads once lead here. Rome is in my humble opinion the greatest city on the planet. While I like many others as well, none comes close to Rome in terms of history, culture, architecture, and influence on the rest of the world. This together with all things that make Italy such a great place to visit - especially the food, of course - makes a combination that I don´t think can be beaten anywhere. 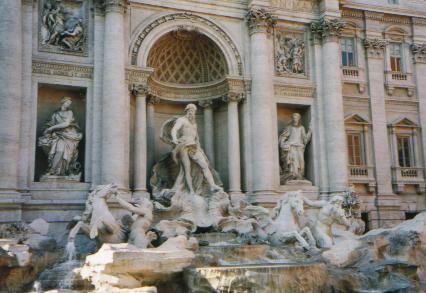 For a visitor, Rome´s sights generally fall in two categories: Christendom and Antiquity, with some great Renaissance/Baroque monuments thrown in (Trevi Fountain, Spanish Steps etc.) For both, Rome is the top place to visit (sorry, Athens, you are fascinating, too, but Rome was not called caput mundi for nothing). The Forum Romanum is just incredible, and the Colosseum, the Triumphal Arches, and the many other smaller ancient monuments (Augustus Mausoleum and the very cool Mamertine Prison, for example) should excite even people who usually have no interest in ancient history (if that is at all possible...). So while of the some things that are said about Rome are admittedly true (smog, heavy traffic, many strikes, enormous masses of tourists), who really cares? It´s Rome, and it´s a huge mistake not to see it at least once. What to say of Rome? It's a city of a thousand different characters, where the best of Baroque and of Classical intertwine to form a fascinating array of art and architecture found nowhere else in the world. Rome is absolutely unique. Some highlights for me include the Galleria Borghese (best of Bernini sculptures), the Palatine Hill (home of the emperors), and the Vatican Museums (simply some of the best art in the world). Regardless of the number of visits you make to Rome, each time you will find something new and wonderful to explore. Rome has a lot of things to see. Churches, squares, palaces. Inside the city there is the Vatican State. It has not an historical centre; like London. It is formed by several zones. Architectural design competitions: De Sanctis won a competition to design the Spanish Steps in 1717. Sites from antiquity with identified architects: Apollodorus of Damascus designed Trajan's Forum, the Temple of Trajan, and Trajan's Column. Cocceius Auctus built the original Pantheon. Rabirius designed the Flavian Palace. Prison: Castel Sant'Angelo was used as a prison for the Vatican. Also the Carcere Mamertino which dates back to the 7th century BC (Livy). Many famous prisoners including St Peter. Zero Mile or Kilometer Markers: The "Umbilicus Urbis" ("Navel of the city") was the designated centre of Rome from which distances were measured. It was situated in the Forum and the remains exist today as a 2mtre high brick structure with a plaque. The "Milliarium Aureum" ("Golden Milestone") was a gilded monument erected by Augustus Caesar in the Forum. Whether it was the same as the earlier Umbilicus is not clear - nor whether some remains existing and marked as such today in the Forum were part of that monument. Today's Italian "Zero Kilometer Stone" is on Capitoline Hil. Famous suicides: Lucretia. She became a symbol of chastity after she preferred committing suicide to living the shame of having been raped. 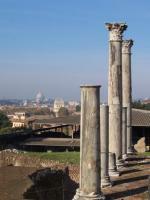 Residences of Roman Emperors: Numerous on the "Palatine Hill". "From the start of the Empire (27 BC) Augustus built his palace there and the hill gradually became the exclusive domain of emperors; the ruins of the palaces of at least Augustus (27 BC – 14 AD), Tiberius (14 – 37 AD) and Domitian (81 – 96 AD) can still be seen......The great fire of 64 AD destroyed Nero's palace, but he replaced it by 69 AD with the even larger Domus Aurea over which was built Domitian's Palace"
Petrosomatoglyphs: The Church of San Sebasiano Fuori le Mura contains a stone "carrying the alleged footprints of Jesus related to the episode of "Quo Vadis" in the apocryphal Acts of Peter"
Astronomy and Astrology: Pantheon: "The monument acts like a giant sundial with a dark interior"
Museum History: Musei capitolini - "The Musei Capitolini, a peerless and precious ancient-art collection, are traditionally viewed as the world's oldest public museum. In 1471 pope Sixtus IV 'donated" to the Roman People a group of ancient artefacts that had previously been housed in the Lateran, amongst which are the She-Wolf, the city's own symbol, the colossal head of Constantine with hand and globe, the Spinarius and the Camillus." Mints: The smallest issuing mint in the world belongs to the Sovereign Military Order of Malta, in the City of Rome. Helen of Constantinople: Basilica di Santa Croce in Gerusalemme. Consecrated around 325AD to hold the "Passion Relics" brought back from Jerusalem by Helena of Constantinople. They were once held in the "Chapel of St Helena" but are now in the "Cappella delle Reliquie" (built 1930). They include parts of the "True Cross", thorns from the Crown of Thorns and a nail from the Crucifixion. Garibaldi: Siege of Rome June 1849. Garibaldi is heavily involved in hand to hand fighting at various points around the walls of Rome trying to prevent an entry by the French. An initial victory at the Porta San Pancrazio is followed by a month long siege and an eventual decision to withdraw to avoid further damage to Rome. Garibaldi goes to the Capitol and makes a famous speech "Dovunque saremo, colà sarà Roma". (Wherever we may be, there will be Rome). Rabban Bar Sauma: 1287: He next travelled to Rome, but too late to meet Pope Honorius IV, who had recently died. So Bar Sauma instead engaged in negotiations with the cardinals, and visited St. Peter's Basilica. Galileo Galilei: Monastery of Sta Maria Sopra Minerva - location of Galileo's trial for heresy and of his "Abjuration". Early Christianity: A number of the Catacombs were constructed by Christians in 2nd century for burials and some services. There are some reamins from that period e.g Mural of Christ Teaching the Apostles ("Last Supper"), Catacomb of Domitilla, Rome, c. 300 AD. Sacred Forests or Groves: A sacred grove behind the House of the Vestal Virgins on the edge of the Roman Forum lingered until its last vestiges were burnt in the Great Fire of Rome in 64 CE. Hercules: Defeated the monster Cacus. 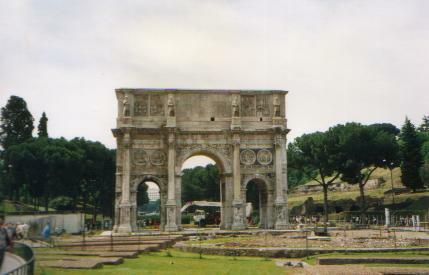 He then (Wiki)"founded an altar, the Ara Maxima, where later the Forum Boarium, the cattle market of Rome, was held. Rome erected temples to Hercules in the area, including the still extant Temple of Hercules Victor. It is believed that a large stone in the nearby church of Santa Maria in Cosmedin is what is left of the Ara Maxima." Marian Shrines: Basilica di Santa Maria Maggiore - the first Marina church in Rome which houses the "Salus Populi Romani", the most important Marian icon in the city. Our Lady of the Catacombs "Shrine in the cemetery of St. Priscilla in Rome. Beneath the basilica of St. Sylvester and above the cemetery is a fresco painting of the Blessed Virgin holding the Child Jesus on her knee. It is considered one of the first images of the Madonna, dating from about A.D. 170. Though the colors have faded and the features are blurred, it is a witness to the Church's ancient devotion to Mary. The figure standing at her left is most likely the prophet Isaiah, who foretold the Virginal conception of the Messiah." Virginity: House of the Vestals, located just behind the circular Temple of Vesta at the eastern edge of the Roman Forum between the Regia and the Palatine Hill. 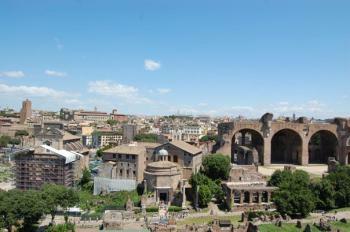 Axis Mundi: Umbilicus urbis Romae, a structure in the Roman Forum from where all the Roman roads parted. Serapea: 3 are known of (all Wiki) : Regio Terte "within the city of Rome was named Isis et Serapis because it contained a temple dedicated to the two Egyptian deities" Campus Martius - "The temple was finally built by Gaius Caligula on the area known as Campus Martius, between the Saepta Julia and the Temple of Minerva and the Temple of Minerva circa 37-41 CE" Quirinal Hill - "The temple built on Quirinal Hill and dedicated to Serapis was, by most surviving accounts, the most sumptuous and architectonically ambitious of those built on the hill; its remains are still visible between Palazzo Colunna and the Pontifical Gregorian University" . Former Largest Cities: From 0-300 A.D. Built or owned by French: The French Embassy in Rome (and hence "French Territory" and therefore "owned" by them) is the Palazzo Farnese. This has been described as "The most imposing palace of the 16th Century"
825 Community Members have visited.